This image of Saturn's north polar vortex and hexagon, the planet's rings and its moon Mimas (tiny dot floating above the rings) was taken by NASA's Cassini spacecraft on March 27, 2017. A dazzling new photo by NASA's Cassini spacecraft captures much of the grandeur, complexity and mystery of the Saturn system. The image showcases the giant planet's bizarre north polar hexagon and the vortex that whirls at its center. 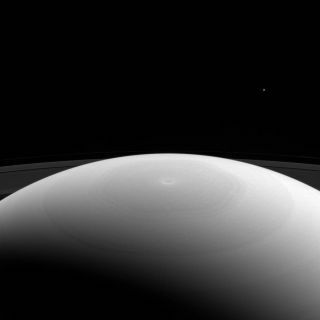 Half hidden in shadow, Saturn's iconic rings lurk in the background, and a bright, tiny dot floats in space above them. That dot is Saturn's 246-mile-wide (396 kilometers) moon Mimas, the smallest celestial body known that has been shaped into a sphere by its own gravity. Mimas sports a 81-mile-wide (130 km) crater, which makes the moon look a lot like the Death Star superweapon from the "Star Wars" films. Cassini took the photo on March 27, when the probe was 617,000 miles (993,000 km) from Saturn and 27 degrees above the planet's ring plane, NASA officials said. The agency released the image yesterday (June 5). Mimas does not actually stand out quite so clearly under these viewing conditions; Cassini team members boosted the moon's brightness by a factor of three to make it easier to see, NASA officials said. Saturn's north polar hexagon is basically a jet stream whose air flows at about 200 mph (320 km/h). The feature, which was first spotted by NASA's Voyager mission in the early 1980s, is about 20,000 miles (32,000 km) wide, agency officials have said. Cassini has been orbiting Saturn since July 2004, and its long and accomplished mission will soon come to an end. In April, the probe embarked on its "Grand Finale" phase — a series of 22 dives between Saturn's cloud tops and the planet's innermost rings. Cassini has completed seven of these plunges to date; the eighth will occur this Saturday (June 10). The Grand Finale phase, and the $3.2 billion mission overall, will end on Sept. 15, when Cassini barrels into Saturn's thick atmosphere in an intentional death dive. The maneuver is designed to ensure that the probe doesn't contaminate the Saturn moons Enceladus and Titan — both of which may be capable of supporting life — with microbes from Earth, NASA officials have said.